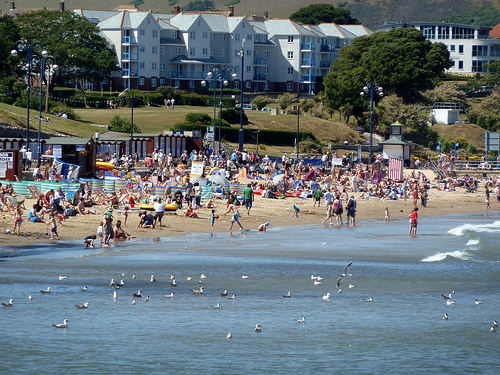 Swanage has one of the most beautiful easily accessible beaches in the UK. On a good day, the sea here looks as turquoise and appealing as the sea in tropical places, and unlike many of the ‘most amazing’ beaches in the UK, it is accessible on foot – you don’t need a boat or to clamber down cliffs just to reach it, it is right there when you walk along the coastal road from the town. If you want to relax and sunbathe in the summer months, this is one of the calmest and most picturesque places you can find, as while it can get busy by its own standards, it never gets close to as packed as nearby Bournemouth or Boscombe. If you are not interested in the beaches, or you are visiting on a day when sunbathing isn’t really an option thanks to the great British weather, there are still plenty of things to do in Swanage. If you are a fan of ice cream (and who isn’t? ), there are some renowned Dorset ice cream shops here where you can try some intriguing flavours, all made from local cream. There is a real artisanal feel in Swanage, and you can tell that the ice cream you are buying was made with love from local ingredients. If you are in the mood for a bit of nightlife, there are also some cool pubs and bars along the seafront, many of which also do very good pub food. Seafood is a specialty here, as you would expect, so even the most basic pub meals, if you choose things like crab cakes or fish and chips, will be made of the freshest and most delicious ingredients. One of the most popular things to do when staying in Swanage is to take a boat trip. You can take round trips along the coast which will usually go about as far as Poole and back, explaining all of the sights you see along the way. Usually, depending on the time you go, these will also feature a bar and food. If you want a boat trip where you can get off and explore, you can also take a trip to the Brownsea Island nature reserve – home to one of the only colonies of red squirrels left in Europe. There are a lot of nice nature walks here and also a restaurant. Swanage is a really beautiful and relaxing place to go if you are visiting the south coast, and if you like the sea, great food and charming places to see, it can be a perfect place to go!